+ POOL Light is a public art installation in NYC’s Harbor designed by Family & PlayLab. 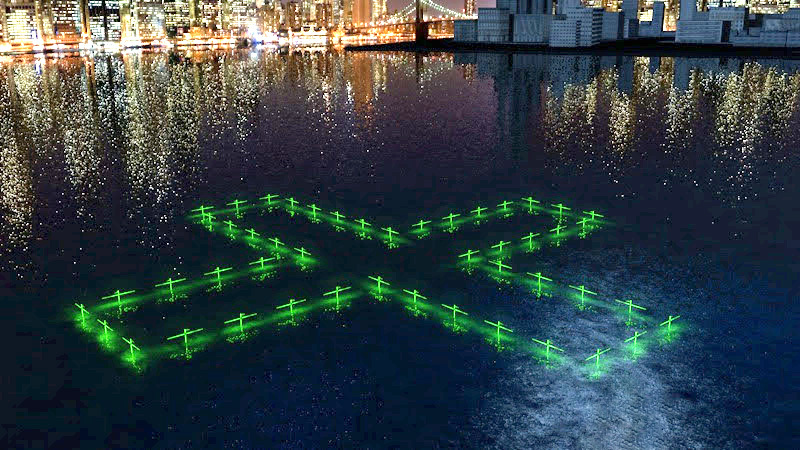 The project visualizes the conditions of NYC’s waterways through a light installation and interactive website, posing the question: what can we do differently to further preserve and protect our waterways? The summer-long public art installation is a precursor to the installation of + POOL in NYC that helps visualize + POOL’s water quality data. Designed by Family & PlayLab, + POOL Light illuminates the physical conditions of the river and rethinks the relationship between the natural and built environments. The installation traces the exact size, 200 x 200 ft, and + shape of the future pool, with LEDs staggered every eight feet that illuminate and change in color based on the quality of water in the river in real-time. Free for the public to engage and enjoy, and viewable from a variety of geographic points in NYC–from the Brooklyn Waterfront to the Bridges connecting Brooklyn and Manhattan–the project offers the community a unique artistic lens through which to view their urban environment and raises awareness about the current state of our rivers. The installation is designed by Family & PlayLab in collaboration with Floating Point and McLaren Engineering. Fabrication support is provided by the Beam Center through its student apprentice program. + POOL Light is made possible by the National Endowment for the Arts. Additional support has been provided by Heineken.